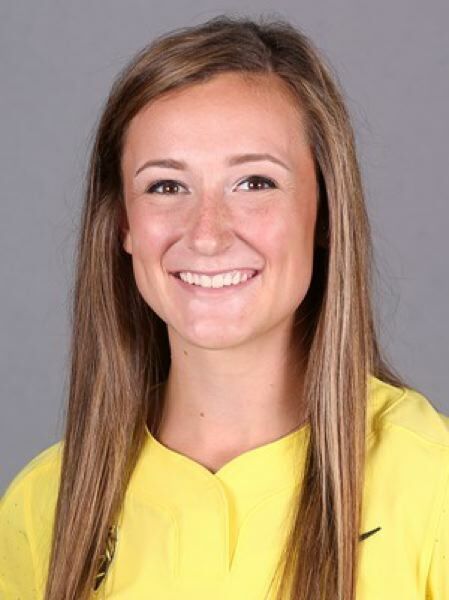 • Megan Kleist pitched a no-hitter against the Grizzlies to cap a 2-0 day for the Ducks. Kleist (7-3) struck out 12 and walked none. The other Griz runner got aboard on an error in the sixth inning, but was caught stealing, allowing Kleist to face the minimum 21 batters. Montana (7-15) gave up 10 hits and three runs in the fourth, two in the fifth and one in the sixth. Mary Iakopo tripled home the first two runs. Mia Camuso's single scored the next two. In the Weber State game, Miranda Elish improved to 9-0, allowing two hits and two walks, with nine K's, in five innings. Oregon had defeated the Wildcats (11-13) 9-1 in five innings on Friday night. The sixth-ranked Ducks (21-4) will play twice on Sunday, facing the Grizzlies again at noon and Bryant at 2:30 p.m.
• The Beavers had a good day in a tournament at Northridge, California. Oregon State extended its win streak to six games and improved to 17-8. OSU then led all the way against Texas Tech, riding the pitching of Meehra Nelson (one earned run, six hits allowed in six innings) and seventh-inning close by Mazon, who struck out two and didn't give up a hit or walk. OSU will play Texas Tech again at 8 a.m. Sunday. • The host Rebels out-hit PSU, 15-6, and improved to 17-7. The Vikings fell to 4-15, scoring in the fifth inning on an RBI hit by Tayler Gunesch. • The Cavaliers opened their Great Northwest Athletic Conference season with a split at Burnaby, British Columbia. The Cavs (11-8) took the nightcap using three pitchers. Starter Kayla Lagerquist (4-4) worked 4 1/3 innings, then gave way to Samantha Byron before Tori Muri pitched the seventh inning, allowing one hit and earning her first save. Jessica Lambourn of CU was 2 for 2 with a double and RBI. Concordia will play a noon doubleheader Sunday at Western Washington. • The Pioneers earned a split in a slugfest, rapping out 15 hits in Game 2 and scoring in every inning but the first. Sydney Cross was 2 for 4 with a double and three RBIs, and Ateisha Norton was 2 for 4 with a home run, two RBIs and four runs scored. L&C raised its record to 4-6 overall and 3-3 in the Northwest Conference. The Bearcats are 1-6, 1-3. The teams will meet again at noon Sunday for a doubleheader in Salem.